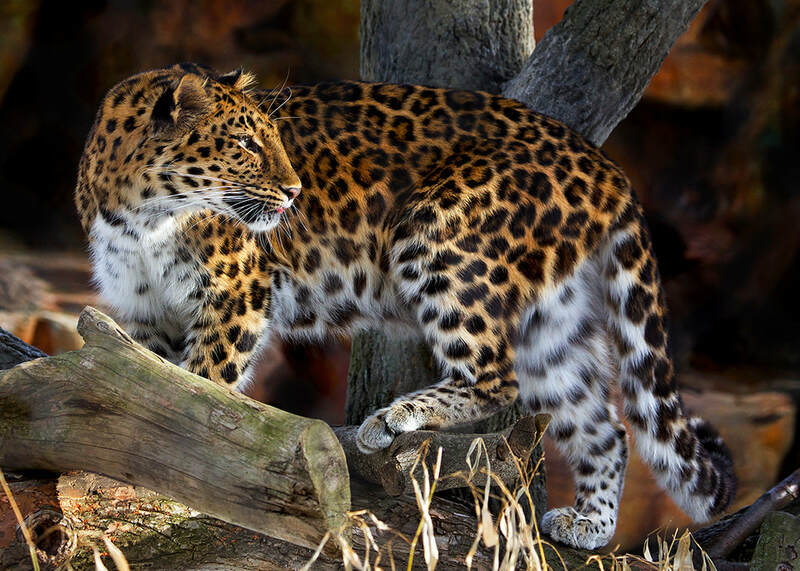 The Amur Leopards have long legs and their fur is much longer than that of other leopards. The fur allows them to hunt yet still keep warm in deep snow. In the summer months the fur is about an inch long but in winter it can grow as long as three inches. The winter coat is a light color and turns more reddish-yellow in the summer. 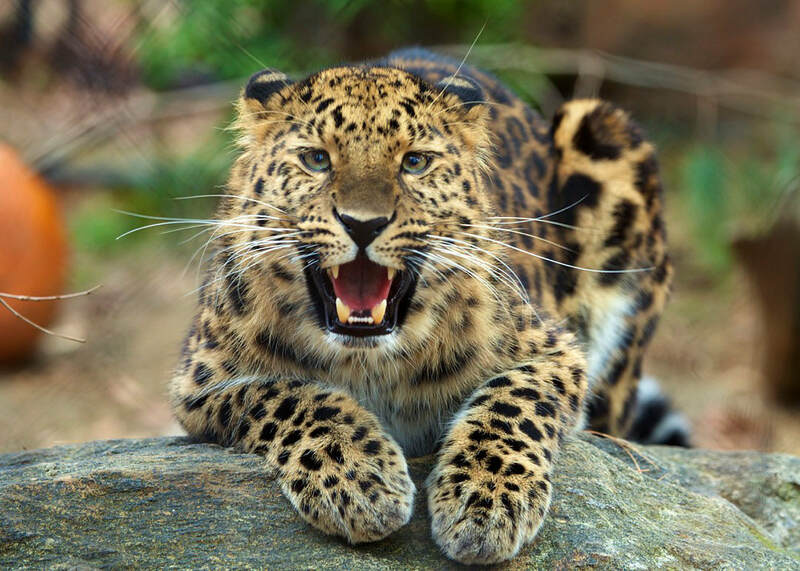 The “spots” on the Amur Leopard are different from other leopard subspecies. They are more widely spaced with thick borders. They can weigh from 70 to 105 pounds. Their long legs allow them to leap across the ground without touching it as far as 19 feet and straight up in the air to 10 feet. Spans the temperate, broad leaf forests and cold winters of the Russian Far East, China and, in the past, Korea. Their name comes from part of their habitat. There is a remote part of the China-Russia border called the Amur River valley. Habitat destruction and over-hunting have reduced the range to about 2,000 square miles in far eastern Russia. Eighty percent of its territory has disappeared in just 13 years. Carnivorous: meat. They will eat any meat they can catch but they are fond of deer, wild boar and hare. 10 – 15 years in the wild, up to 20 years in human care. Most live alone rather than in families but a few males have been documented to stay with females to help rear the cubs. Litter size is 1 to 4 cubs that leave their mother at 1 ½ to 2 years old. Some males have even been known to follow a female and fight with another male over her. Critically Endangered. A recent census estimates that there are less than 30 wild Amur leopards remaining. That is at least 66 fewer than are needed to ensure the survival of the species. 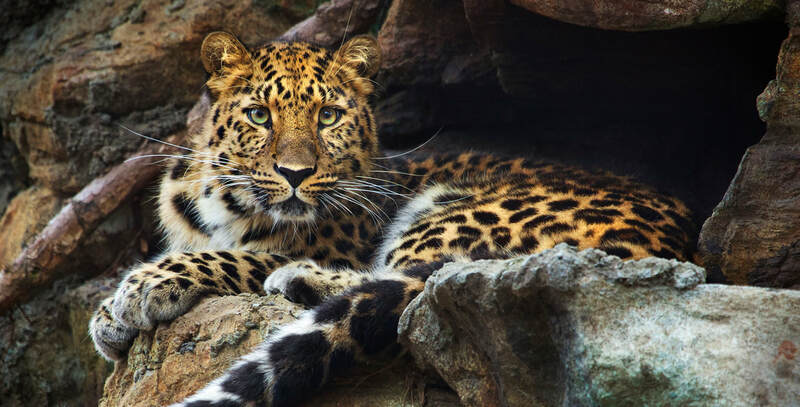 Connecticut’s Beardsley Zoo is a proud participant in the Amur Leopard Species Survival Plan. The Amur Leopard is a subspecies of leopard also known as the Far Eastern Leopard, Manchurian Leopard, or the Korean Leopard. The various names are based on the historical range of the leopard. These nocturnal big cats are the rarest big cat in the world. They like to drag their food up into trees to protect it from other predators. The Amur Leopard does like water but not as much as the tiger.